Welcome to the next installment of Pocket Finger, a collection of seven illustrated stories created by Ryan Call and Christy Call. Each piece was composed in alternating turns: Christy drew an image, Ryan wrote a text, Christy drew an image, Ryan wrote a text, and so on. A new story has been released for free these last five weeks, with a couple more in the queue. If you’d like to read the old-fashioned way you can purchase a print version at PublishingGenius.com. I could not recall the details of the car crash that took from me the bits and pieces of my memory, my daughter’s ability to speak, and my wife. I could only rely upon the specific details that my surviving family members and friends described to me, the reports issued by the city police department, the photographs of the accident scene, the various statements of my lawyers and doctors, all of which I had dutifully organized and filed in a locked cabinet in my study. And, of course, I had the scribblings and drawings of my daughter. But I could not recall the accident itself. 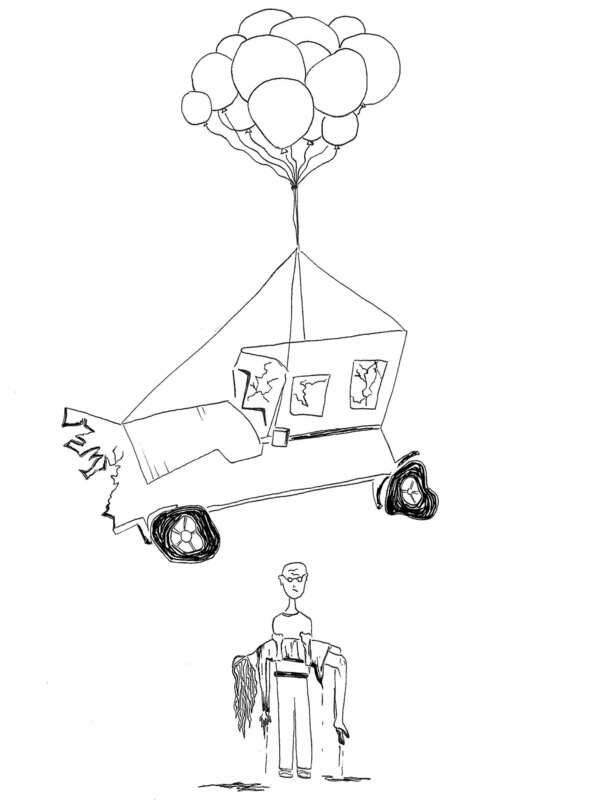 Once we had returned from the hospital, I decided that my daughter’s misshapen illustrations, above all other sources, could provide for me the clearest narrative of that day, for they captured a sense of the crash that the other sources could not possibly convey. Despite their awful imagery, I gravitated towards this final explanation of how my life had screeched and churned its way towards a kind of wreckage, a disaster one might hope to avoid throughout the entirety of one’s life. I often wished to plunge into any sort of dream-state, however terrible, if such a dream-state meant that I could guarantee this wreckage had never actually occurred in my life. Instead I went about sleeplessly, for I could not stand to awaken from my dreams to discover that all the waking hours I was fated to live were far worse than any nightmare my mind could possibly create for me. Of course, with the medicine prescribed to me, I now sleep easily, for the doctors have found a way to calm my mind each night before they secure me to my bedframe. And so, those nights home after our return from the hospital, I often stole into my daughter’s playroom after she fell asleep, excavated from the heap of unused toys one of her many bound sketchbooks, and quietly flipped through its pages to discover what new element she had incorporated into the narrative of our crash. She recently had taken a liking for bunches of balloons. I often functioned as a hero within the pages of her sketchbook, though I am anything but. Take, for instance, the above image: my wife, dead; her body, broken, dangling there beneath some clot of rising balloons, caught about beneath her armpits by a lifesaver, a misshapen steering wheel, a corrupted halo of indeterminate nature, something terrible and ringed—what exactly, I do not know—through which her head droops, motionless. Sadly, my daughter has filled pages upon pages of fine, heavy sketch paper with this very image, or images very much like it, the images mirrored one upon the other, tessellating across one page through the shadowed gutter and onto the facing next. She has become a desperate kind of artist, a sadness artist. I cannot bear to let her illustrate in color, for blood, too, as with the balloons, had slathered itself across her mind. It is enough that I must witness the graphite shadings—her troubled attempts to depict her mother’s blood—that she has marked across the paper: the blots upon her mother’s dress, her mother’s legs, each image of a daub scoring itself upon my mind, a cross-hatched grief marker. I have removed from the house all coloring utensils: markers, crayons, paints. And yet her imagination, her talent for capturing that most vivid of life’s experiences—the spilling of blood—never ceases to both amaze and horrify me. Perhaps I ought to be thankful? Then shortly after I had taken to staying in her room, I confiscated her sketchbooks, for the images within them troubled me. My daughter’s extensive conceiving and drawing and coloring those horrific images onto the pages troubled me. Her disappearing into those illustrations troubled me. So without her art supplies, my daughter then resorted to a performative sort of rendering of that fatal day: she took against herself a pair of old kitchen scissors, etching and snipping her grief all about her person. I discovered her one evening standing blankly in the exact center of our living room, a bit hunched and vacant, some half-deflated balloons at her feet, a set of scissors running a vertical line of marks down the center of her dress, traces of blood now seeping through the light cotton. She had focused first upon the hem above her knees, striving to cut it down to an appropriate size, I supposed, and then there upon its front she had tried for the shape of a heart, but the blade had long ago fallen into dullness and instead had slipped, nicking her skin several times. She would not explain to me her designs upon herself, her purpose for such behavior. She refused to write down her thoughts in full just as she refused to speak, and each time I pushed the pencil towards her, a slab of notebook paper, she merely wrote, repeatedly, a single word, and none other. And soon the word wreckage spilled out across the papers, and she wrote, tore, and tossed all the sheets so quickly into the air above our heads that I could not keep up with the text scribbling from the pencil, the text flitting here and there about the room, the sheets shuddering through the air. I could not stop her, no matter how hard I tried to secure her arms, her flurrying hands, the jerking of her fingers, and so I relented. I ceased to reach for her then, instead chose to allow her to act out whatever scene she thought important, for I suddenly found that I too could not still the pounding of my heart, the seizing clutching show of that relentless muscle thudding away within the cage of my bones. I felt that I might die of grief. But I had never heard of such a thing truly happening. And then the room collapsed and sleep overtook me. 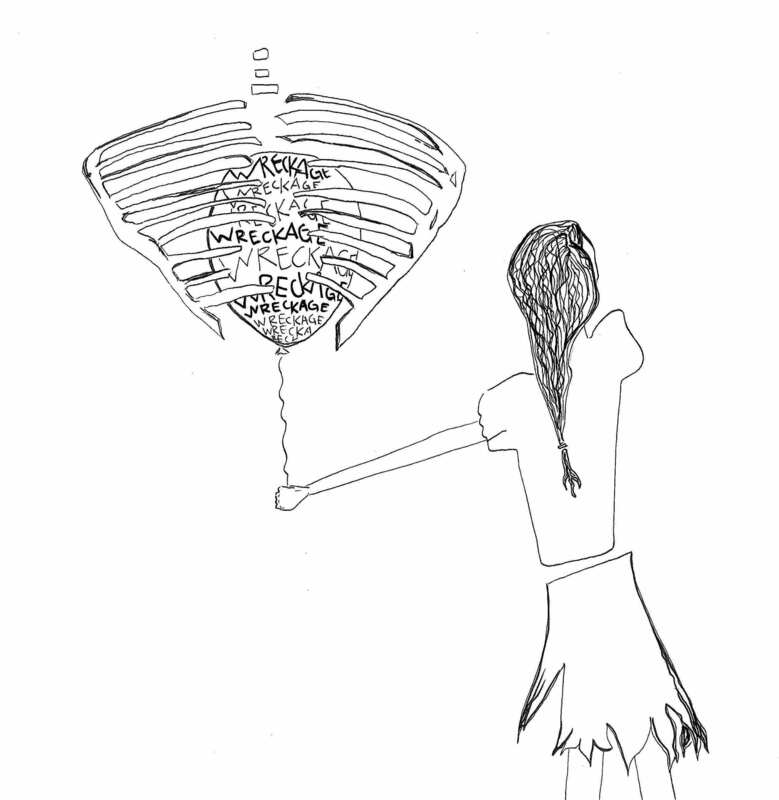 Yet, still, another image: my daughter, a balloon, a cage of bones. This she had scratched into the ceiling above her bed some night as I slept on the floor nearby. She had used a broken bit of mirror, a leftover from the havoc of the previous evening, and her bloody fingers had stained the ceiling, and drops of her blood had dropped onto the bed sheets below. I discovered her sleeping uneasily on the couch out in the living room, her fingers bandaged loosely with masking tape and dishrags from the kitchen. 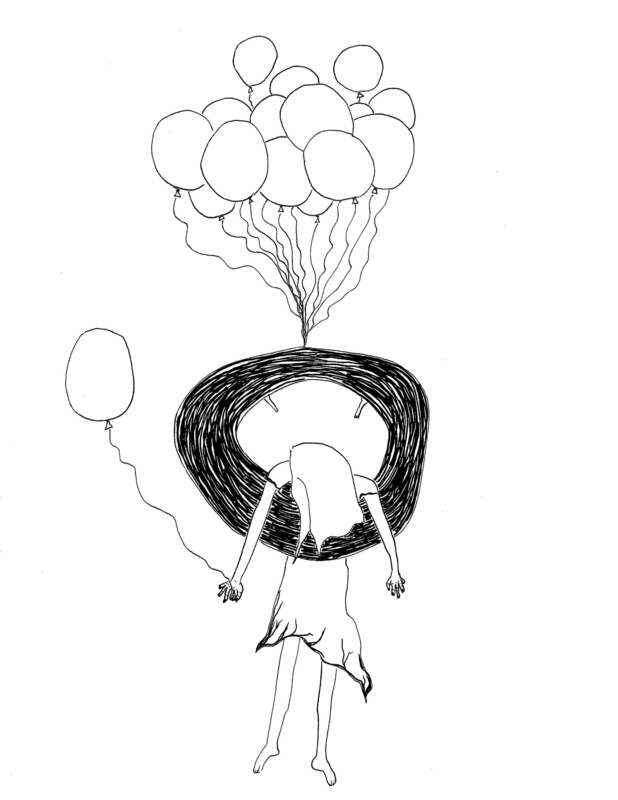 Scattered around her had fallen the limp, airless forms of countless balloons. In a corner of the room stood a tank of helium. Bundles of loose parachute cord draped across the coffee table and snaked about the room. How she acquired all of this material, I did not know, but at that point in my life much of what I experienced in the time after the wreckage did not register upon my body, within my head, against my senses. Still, I ought to have caught wind of her intentions. How could I have missed her? When had she decided to fade away? What sort of father to my desperate daughter had I become? Days then my daughter spent out in the shaded carport, manufacturing and creating. She had promised me that she would no longer harm herself, and so I relented when she begged me—via a crudely written message taped to the fridge—to allow her to make use of the carport for her new workspace. Of course, I could do very little to help her with her new project, as I had never considered myself to be a very handy person, and yet out there she worked towards some sort of end, using whatever assorted tools I had acquired over the past few years. For how long or to what purpose, she would not reveal, but she worked, and she worked quietly and without my approval or supervision. The outdoor lights glared throughout the night, and then the sun shone down upon the aluminum structure throughout the day. She had taken to a secretive sort of existence those past few weeks, for whenever I approached her work area to encourage her to come inside or to give her a bit of food, she pulled a hidden lever somewhere by her head to cause a large canvas tarp to drop down upon her creation, hiding it from my view. Her eyelids too she lowered. Then she no longer allowed me to look into her face. As I watched her through the window, I learned by bits and pieces that she meant to build a rudimentary sort of diorama, or scene, or vehicle, or other mechanical configuration. She carried back to the carport all manner of materials that she had scavenged throughout our house: some boards and wiring she had found in a far corner of our attic, the bench seat and steering wheel off an old golf cart we had driven up and down the streets each fall to trick and treat the neighbors, buckets of sand and rocks from the garden shed out back, a couple of rusted bicycle wheels we had left in storage in the crawl space, some old store mannequins from a flea market weekend my wife had purchased at the local elementary school years ago, a great big cardboard box full of light bulbs and batteries we stored in the utility room, some of the bed sheets from the linen closet. Of course, such a list could never be complete, for I did not know what else she removed from the house as I slept. I only realized at the time that items I thought I had placed securely in one location had suddenly disappeared. Soon our house became a bit less full, a bit empty in places, but empty of the kinds of things one might not always realize one missed until one needed them. While I could not possibly know at the time what she meant to create out of all of these insignificant objects, I now realize she had been trying to warn me against that very mistake. You should always remember, her actions seemed to say. Of course, I could not understand this truth yet. I could no longer even remember the nature of my deceased wife. Several days after the last haul of her treasures the sound of her work stopped. I noticed the silence one morning as I stood in the kitchen and thought sadly what I ought to do with my day, how I might fill it up with meaningless tasks so as to distract myself from the horrific pain I felt inside of me. I sipped my coffee and stared out the window and into the carport. She had moved her creation to the garage and lowered the tarp over it, but I could not see or hear her anywhere. I put down my coffee and went out through the screen door of the kitchen to check on her creation. I figured now I might discover her. I pulled the tarp away. While it has been quite some time since I discovered my daughter there in the garage, hanging before the diorama she had created for me, I can still quite clearly see the exact nature of the scene that greeted me as I pulled up that tarp. I suppose she had achieved her purpose. Unfortunately, I will never forget her. You see, she had tied the extension cord around her neck and then around a joist in the rafters of the garage, and to the cord about her neck she had attached a bundle of brightly colored balloons so as to give the impression that she dangled beneath those balloons. 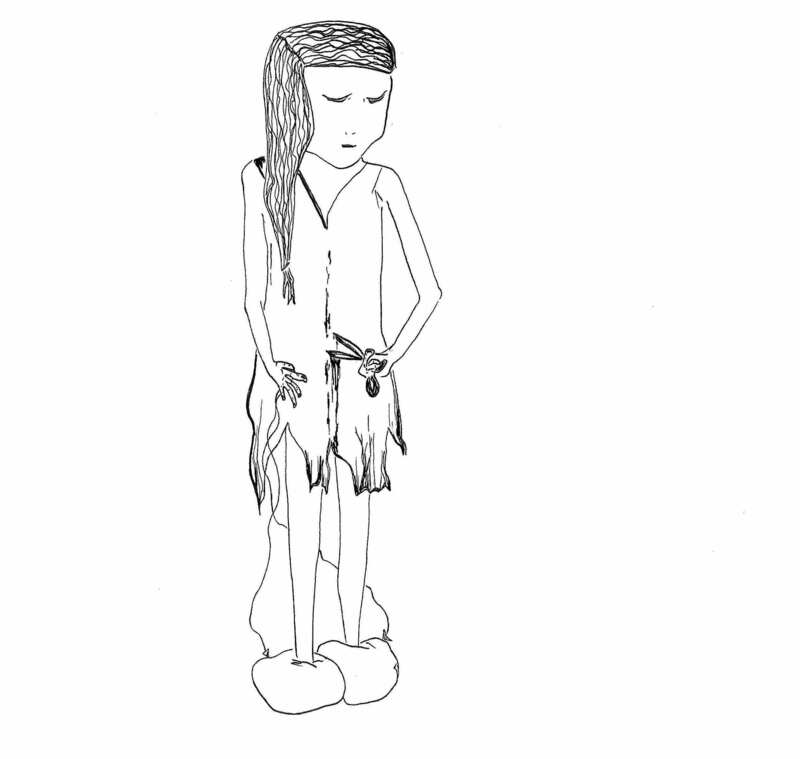 She seemed about to float up and away from the garage, her feet only inches from the floor. Scattered beneath her I found the documents and photographs of the wreckage that I had preserved. Elsewhere throughout the building she had released countless balloons, and these drifted aimlessly too and fro, at various altitudes, bumping and settling into one another as a fan in the corner whirred back and forth, the clicking of its fan blades within the plastic casing the only sound throughout the garage. 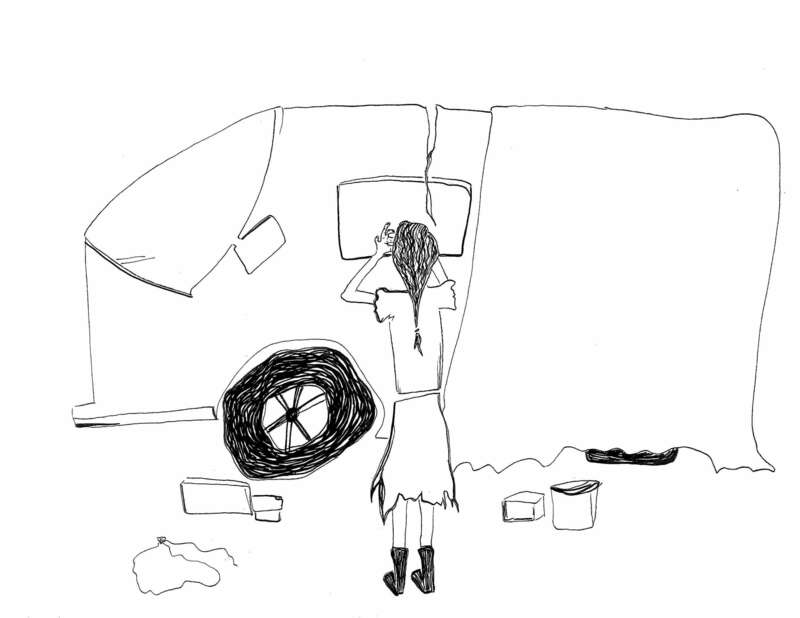 Behind my daughter rested the wreck, or how her teenaged mind had imagined the wreck to appear. She had constructed it as best she could: extra aluminum siding she had hammered and formed into the frame of our family van, the bicycle wheels she had placed appropriately, and an old window and mirror functioned as the front windshield, parts of which she had shattered and broken all about floor. Other bits of scavenged items from around our house she had used to fill in wherever she thought they best approximated some aspect of that wreckage. For example, the love seat from our back patio, on which her mother and I took our coffee each morning before the day began? This she had situated behind the front seats to create the first row of passenger seats. Across this seat, she had stretched out one of the sewing forms. In the front passenger seat, a busted up lawn-chair I had used for years sat crookedly beneath the smashed windshield and ironing bench that she had used to signify the dashboard. In this chair she had placed another mannequin, her father, I presumed. Then, in the driver’s side, the golf car steering wheel pushed down over its head, hunched over the broken figure of the third mannequin: her mother. I remember collapsing to my knees. Our neighbors claimed they found me wandering the street, weeping. Now, as I rest here in the facility, all I have of my daughter is that hanged image. Of my wife, all I have is her hand. So, what then might prompt a man to daily review the horror of his life, to recollect the details of his family’s wreckage, to write down such a terrible history as this, if he can simply spend his evenings in a medicinal haze? What prevents such a desolate man as I from disappearing into that drug-fog of no-memory throughout his remaining time alive? For if this is the story of my family’s destruction, you might ask, then why do I continue to wallow in its plot? The answer: the still very real presence of my wife by my side. The ending of my story goes like this: during one of my evening solitary walks through the grounds of the hospital, walks I habitually took after dinner to calm my mind as I prepared for sleep, I came into possession of a final object, a memory-piece, a ‘thing’ that might be a constant reminder of all I had treasured in my last life. I had slipped quietly away from my nurse and reached a corner of the grounds to gather myself for the coming night—I feared the side-effects of the medicine they gave me, for while it calmed my thoughts, the medicine created an immediate and significant discomfort for me physically as its numbing properties overtook my body and mind. As I went into my counting routine to clear my head, I saw in the chalky sky a bright red balloon falling gently towards me, an object somehow dangling beneath its sphere. The balloon traversed the sky, dropping slowly edgewise towards the fence before me, missing the trees and then scooting down across the grass before the object lodged against an embankment down the pathway a little ways from me. I hurried over to discover there at my feet my wife’s descended hand, raggedly severed but otherwise intact and bloodless seeming. About her ring finger circled her slight, gold wedding band, one that I immediately recognized, for she and I had together designed it to pair with my own. Reader, before you question me, know that I had little time to consider my action. Know further that I do not at all regret what I have done, now that I have contemplated its significance in my unhappy life. You see, just then as I had squatted down to further examine my wife’s hand, the nurse called out to me and I heard his footsteps upon the path as he drew closer, so I did what any good and honorable husband would do in my situation: I picked up her hand. I hid her hand carefully beneath my hospital gown in such a way as to allow the balloon tied to it to freely rise up and away from my body. I made quite a show of what—the balloon, not the hand—I had discovered. The nurse relented in the face of my pleas and allowed me to keep the balloon. Later that night after all of the others had gone to sleep, I revealed my wife’s hand and examined it closely in the moonlight. I had cleverly hid the pills under my tongue earlier in the evening so that I might be of a clear mind as I contemplated her hand and what it might mean for my life from that point forward. I gently touched her hand, caressed the skin about her wrist just above the stump, turned the ring on her finger, interlocked my fingers with her own. Her hand felt cool and dry to my touch but not at all unnatural or decayed or anything of that sort. Rather, her hand felt to me as if I had just greeted her in the morning as I often did, leaning over to clasp her hand and kiss her on the mouth before we each of us left the bed to carry on with our separate days. I pinched again the ring and turned it on her finger, another anxious habit I had long ago developed, much to her annoyance, and which I often pursued as we sat on the couch together and idly watched television. Each moment I spent with my wife’s hand there in that hospital bed brought to me memories of our time together, and I fondly recollected my wife. But with each memory also came the awareness that other memories of our lives together I had finally forgotten, these memories had disappeared, and the emptiness these forgotten memories left in their absence appalled me, for if I could not at all remember those times, had I then, I wondered, truly lived them? What had I then to remind me that I had indeed lived that life, that I had indeed participated in that marriage, in that relationship, in that parenting, for the cold grey ward of the hospital and the medicine I nightly took seemed like my only reality now, and the distance between myself and my wife and my daughter grew daily and with each passing moment of my so-called recovery. I resolved that night to record as best I could all that I could recall from my life so as to better remember it, for by recording it, writing it down, keeping it, I could ensure that it had happened, and I could ensure that I would never forget that it had happened, and in doing so, I still might yet keep alive my wife and daughter. I resolved that night to work my way backwards, to travel back through each memory until I could no longer go backwards any more. Then I might reread it all from the very beginning to better understand all that I had experienced. I retrieved my notebook from the drawer of my nightstand. 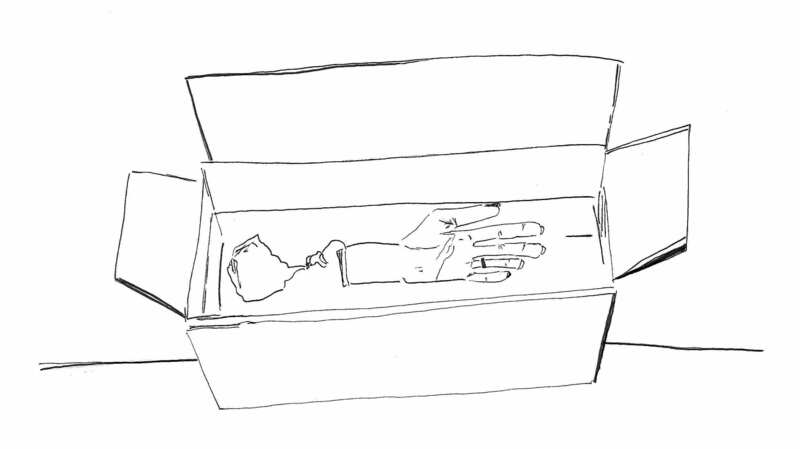 My wife’s hand I secured in a small wooden box beneath my bed. 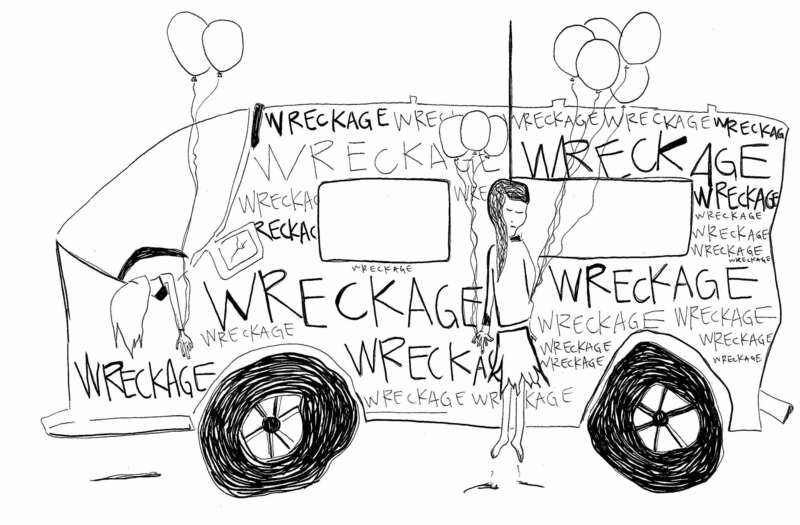 The story of my life I began with the story of its end: wreckage.